Early in the morning on Saturday I met Yordanka and Giovanni in the railway station of Xanthi city. At 3:45 we left by train form Xanthi, our destination was Serres. We arrived at Serres at 5:50 in the morning but the bus to Sofia was leaving at 9:00. So in the morning we went to the center of Serres city (about 2 Km) to drink a coffee. Niki was coming by bus from Thessaloniki. We entered the bus and we crossed the Greek-Bulgarian border without excessive delays. At 13:00 we arrived in Blagoevgrad city. While waiting for the bus a man offered to transport all of us to Bansko, for a price equal to the bus ticket. The road to Bansko crossed beautiful forests and on the left we had Rila mountain, while on the right we had the Pirin mountain range. We stopped in the wonderful Bansko city to buy food and with the same car we continued to Bandiritsa refuge. 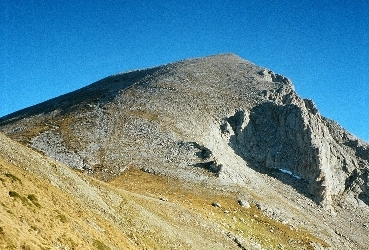 The narrow road passes by the forests of Pirin mountain. Big parts of the forest had been cut in order to make more and more ski pists. 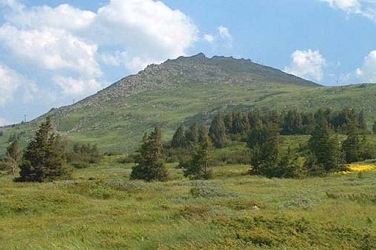 We arrived in Banderitsa (1850m) and immediately we began trekking to Vihren refuge. After 30 minutes we arrived in Vihren refuge where we planned to stay at night. The refuge is open in summer and most weekends of the year. We slept from 7 in the evening since we hadn't slept the previous night. Yordanka staid awake because I was snoring. We woke up very early in the morning in order to have all day available for climbing. at 7:40, we began trekking to Vihren peak. We followed the path with the red stripes, which crosses the small stream. After an hour of trekking we reached a plateau. Just on the right is the Vihren pyramid; we continued the path which follows to the left. Following the path we continued trekking up the west ridge of Vihren. At about 10:40 we reached the Vihren summit at 2914m, which is the second highest peak of Bulgaria. The view from the peak was amazing, but after little time the first clouds appeared. We begin to trek back with a fast tempo. On the path we met a lot of climbers on their way up to Vihren summit. At 12:00 we arrived back at the Vihren refuge and after a short break we continued the trek back to the Banderitsa refuge, where we arrived at 13:00. The driver arrived after half an hour and picked us up to take us to Bansko. We stopped in Bansko to drink coffee and Kamenitsa, a Bulgarian beer. From there he drove us back to Blagoevgrad where we left Yordanka near her home and we continued to Sofia (Nikolas, Niki and Giovanni). We decided to stay on the outskirts of Sofia in a cheaper hotel, and we stayed at the Diana III hotel for 40 euros a night for an apartment. Finally we understood that this was not the best solution for a hotel because it was far from the center. At night we took bus No 94 to go to the center of Sofia, in order to find out how we would go to mount Vitosha the next day, and to find a cheaper hotel in the center for the next night. Early in the morning we went to Edona hotel in the city center, where we decided to stay the next night. From there the bus station is not far. Giovanni travelled back to Greece, and Niki and I got on Tram No 9, heading for the southern suburbs of Sofia. Afterwards we took bus No 64 and we went to Dragalevski village where the Lift takes you to mount Vitosha. Sadly, it was Monday and the lift was not working. By taxi (15 Leva) we went to Aleko Ski center. At 11:00 we began trekking without following the correct path, and after an hour we met a narrow dirt road which climbs to the peaks. It was foggy and we could not see the peak. The slopeswas plane and a lift went directly to the highest peak of Vitosha, Cherni Vrah 2290 m. We reached the summit at 12:30 but it was cold with very humid. The trek back was easy and we followed a sorter path to the ski center. Here we were very lucky, as two German couples with a mini-bus gave us a ride to Sofia. They drove immediately to the wonderful Alexander Nevsky church, the building of which began in 1904 and finished in 1912.The rest of the day we walked around Sofia city. We sat down for a beer and then we ate in a Chinese restaurant. In the morning we walked in the city and we took the bus to Blagoevgrad at 12:30. Because a new road was being constructed to Blagoevgrad the bus made a detour, and about 2 hours were needed to reach Blagoevgrad. The bus station in Blagoevgrad is about a kilometer from the center of the city. The center begins from the American university and after that there are a lot of squares and there is a straight pedestrian road with cafes. Here we met Yordanka and we stayed and drank coffee together. We strolled around the center of the wonderful Blagoevgrad before walking back to the bus station. We went by bus back to Greece without a long delay at the border. I got off at Serres city (21:30) while Niki continued onwards to Thessaloniki. I had to wait until 00:30 for the train going to Xanthi. Finally, at 3:30 on Wednesday morning I arrived back at my house.